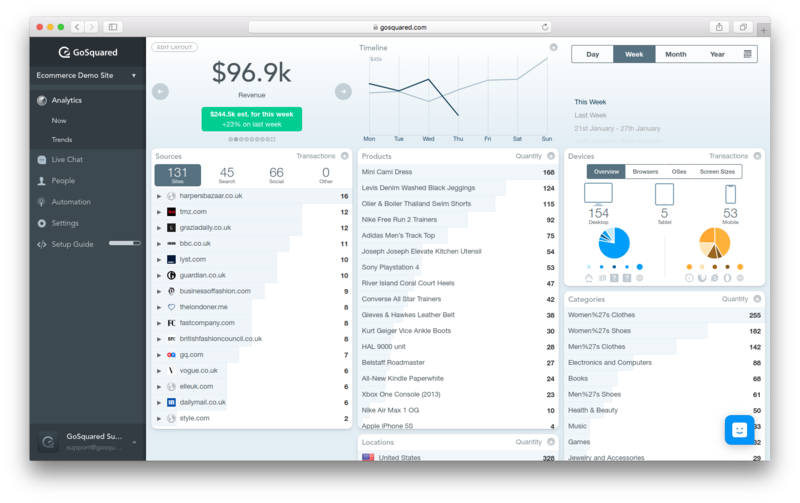 GoSquared Ecommerce Analytics brings your essential sales and business metrics together in an elegantly simple live dashboard. Ecommerce Analytics works by tracking visitors to your online store, and collecting information about transactions when they make purchases. Note: Ecommerce Analytics is available as part of GoSquared for Enterprise. When you register for Ecommerce Analytics, you need to implement website traffic and transaction tracking so GoSquared can collect this information. To begin with, check the integrations list to see if there is a GoSquared integration with your platform. Often it's much easier to use an integration because it usually requires no custom coding. If there isn't an integration available, follow the custom integration guide. Your most important KPIs are displayed here to provide an immediate understanding of performance. A comparison against the previous period puts those numbers in context. How do we understand how and when our numbers are changing? Timeline reveals growth or decline by clearly visualising metric history up to the present moment, and compares the current period against the previous period. Jump to a different day, week, or month in a single click. Changing the time frame here will immediately switch all widgets in Ecommerce. Scroll up and down to jump back to time frames further in the past. What Ecommerce metrics does GoSquared track? How do we see where our customers are coming from? Traffic Sources shows which acquisition channels are most effective. Even down to an individual Tweet. Top selling products propagate to the top of the list, while unpopular ones sink to the bottom. Products can be arranged by revenue, purchases, and more.